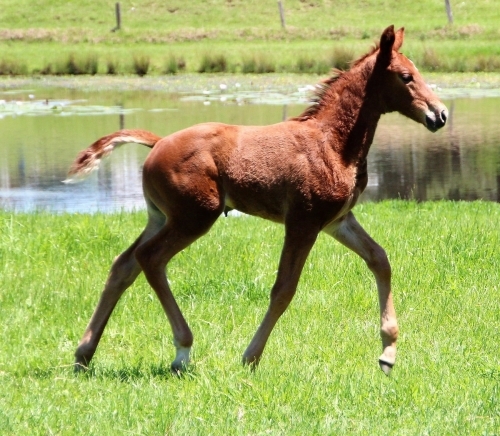 Firefly is a delightfully pretty and perfectly correct filly with outstanding bloodlines. She is by French Kiss (IFS) who was the World Champion 6yo young dressage horse in 2004. French Kiss is by Florestan I, one of the top sires in Germany whose bloodlines are developing into a major dynasty in terms of the top Grand Prix dressage horses competing at Olympics and World Championships. French Kiss progeny are renowned for their high rideability. On the dam line of French Kiss is Donnerhall, the number one cornerstone of the major dressage dynasties. Firefly is out of Rubis Etoile, a beautifully correct young mare by the legendary Regardez Moi, who needs no introduction. He has been Australian Grand Prix Champion three times and represented Australia internationally. 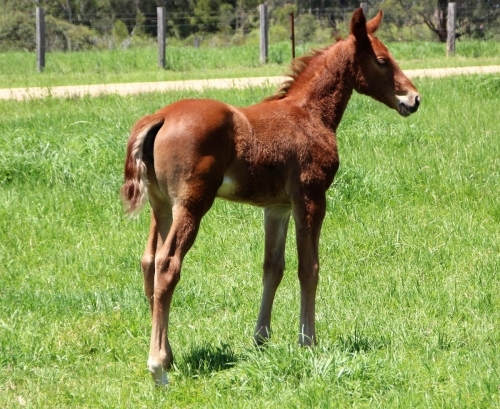 He has sired many Grand Prix dressage horses including Utopian Cardinal, the 2016 Australian Grand Prix Champion. On the dam side is the NZ TB sire Filante, who has produced good jumping horses, including a talented high level eventer, Diamond Snagglepuss, ridden by Sandy Lucas. Filante’s dam is by the legendary Sir Tristram, well known for producing jumpers and eventers of top quality. Firefly has beautiful movement, excellent hock action and is very light footed in front. She is very well-balanced with the sweetest nature. If you are planning on bidding online please make sure you have a reliable internet connection. If for any reason you have difficulty getting your bids in please call 0447 008 470 or 0419 294 812.